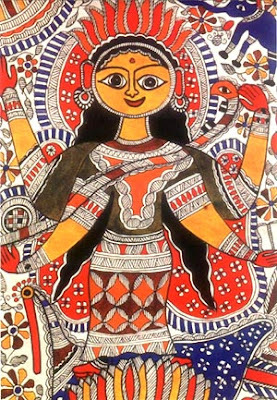 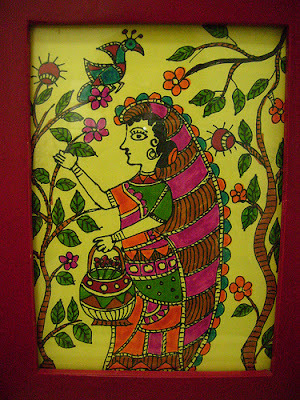 Madhubani Paintings are usually done on freshly plastered mud walls of homes in Mithila. 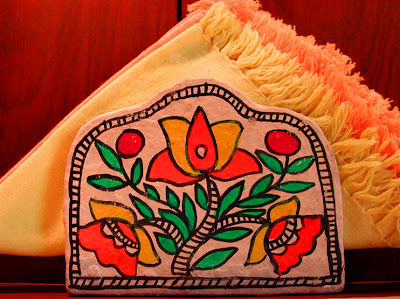 Vegetable dyes are used in the paintings and the skills are passed on from one generation to the next. 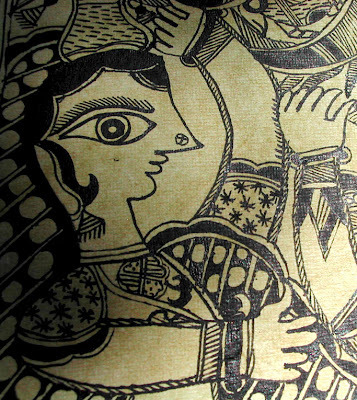 Interesting simple black & white Madhubani painting on handmade paper. 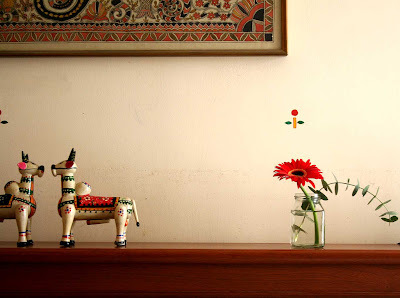 Colourful bulls and red flower compliment the mutli-coloured Madhubani Painting in Mallika's room. 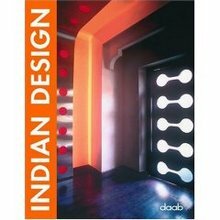 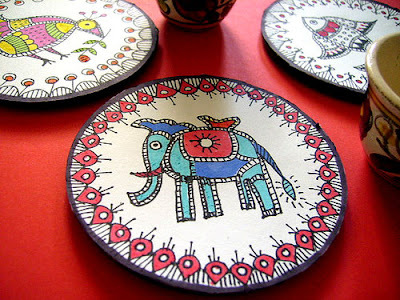 You can bring in this colourful art into your home not only in the form of paintings but also home accessories like magazine holders, napkin holders, lamps etc. 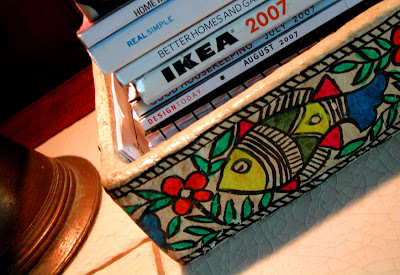 Paper-mache' Madhubani magazine holder My favourite Madhubani Napkin Holder. 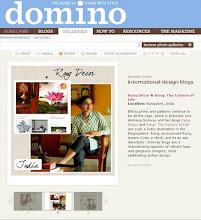 Today I am featuring one of my very talented Flickr friends arty_zen from Singapore. 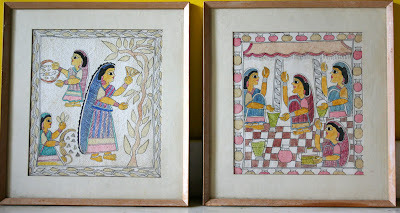 She does Madhubani paintings on mundane things and converts them into pieces of art. 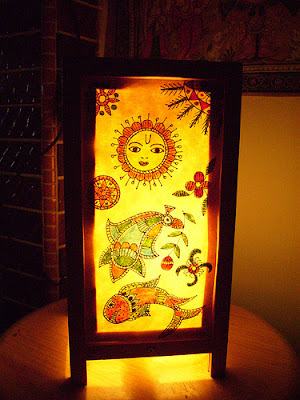 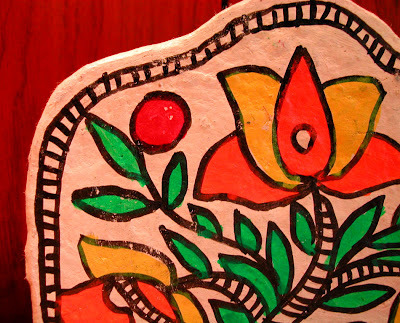 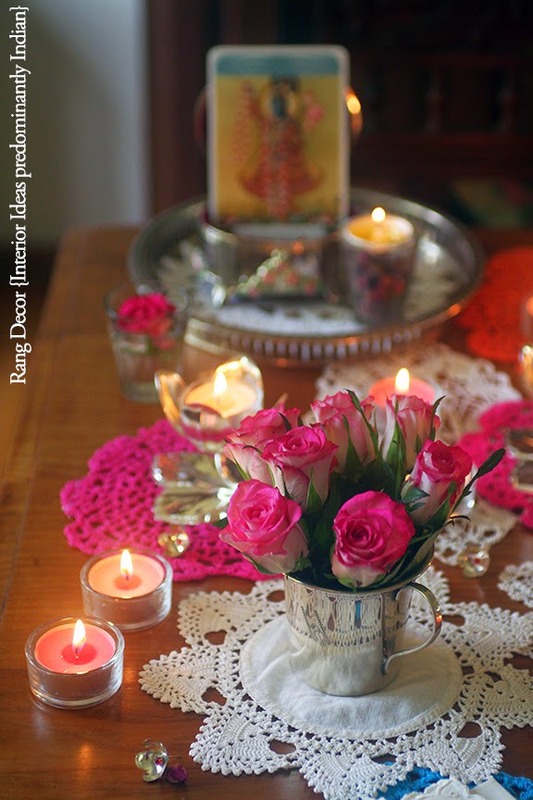 A plain lampshade gets transformed into a luminous glowing Madhubani art. 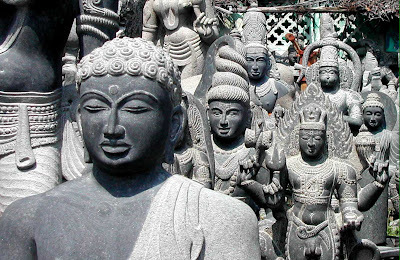 Apart from being a Unesco World Heritage Site, Mahabalipuram is also a hub for stone carvings & idols. 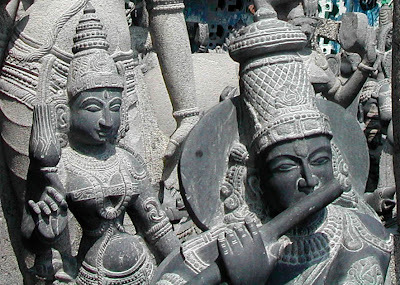 The sculptors or sthapathis as they are known in India, have been carrying on this rich tradition of carving from their forefathers where they use Vaastu Shastra as well as mathematical precison for the execution of such exquisite sculptures. 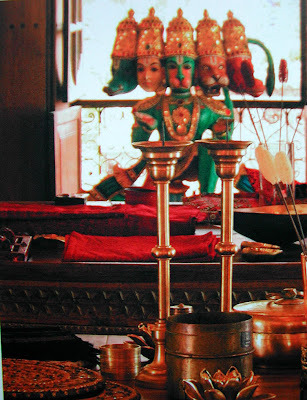 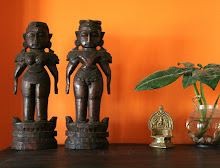 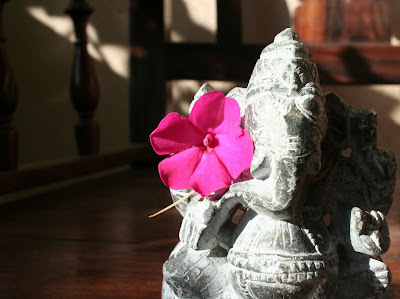 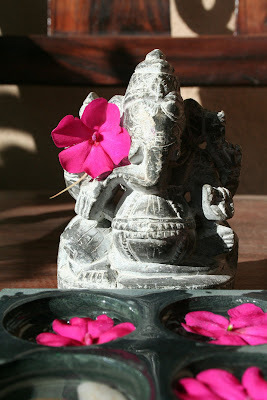 Here you'll find idols in various sizes and shapes, some specially made for temples, some custom-made for hotels and smaller ones for homes & gardens. 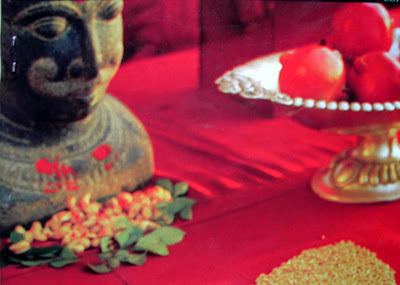 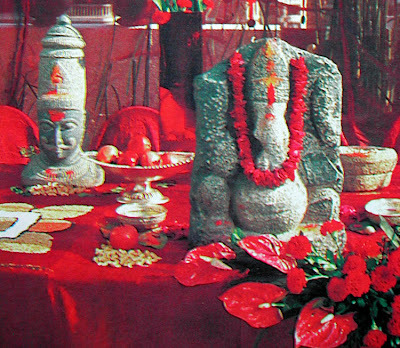 Idols of Hindu Gods & Goddesses such as Ganesha, Gaja-Lakshmi, Shiva, Nandi are common. 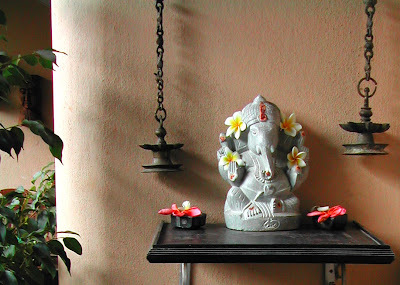 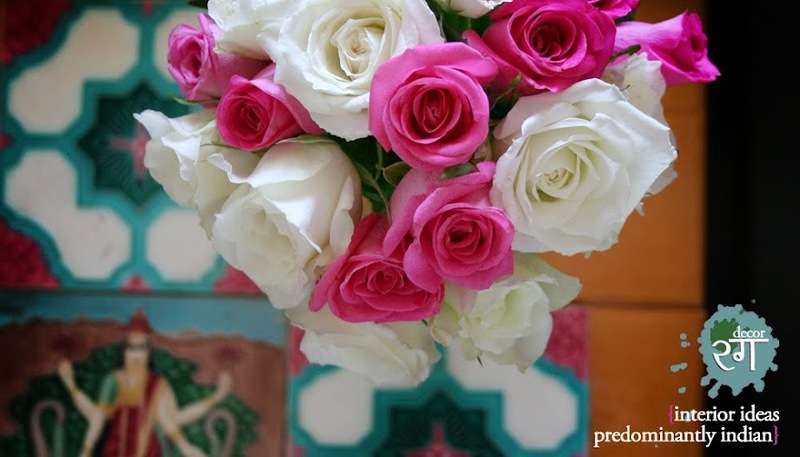 Here are some interesting ideas for using stone sculpture in home decor. 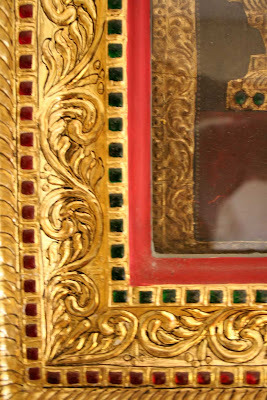 Restoration noun-The act of making new or as if new again. 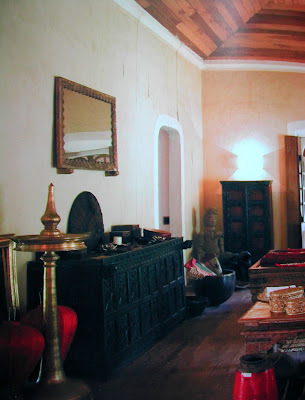 This word brings immense happiness to my heart, whether it is rescuing the old door from a demolished Chettinad mansion and giving it a place in our living room or giving a new lease of life to antique dowry chest picked up from the bylanes of a village. 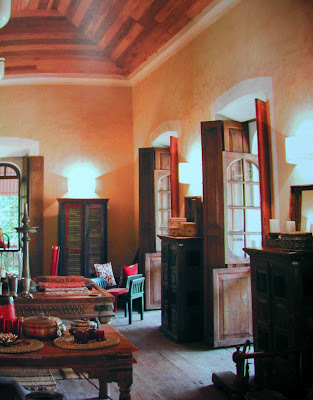 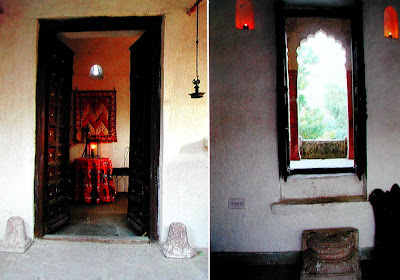 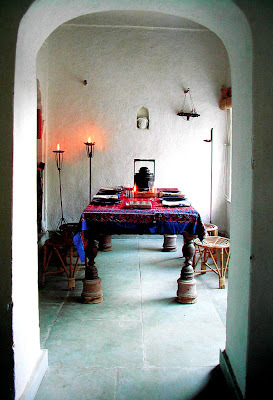 This Haveli built in 1776 on the outskirts of Delhi was restored by art historians Francis Wacziarg and Aman Nath. 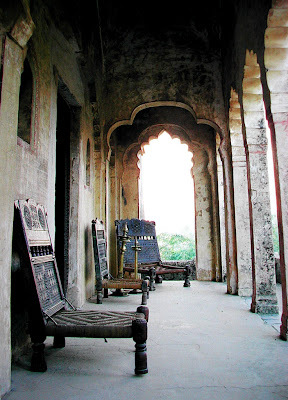 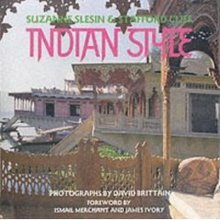 The Haveli which is a synthesis of Hindu & Islamic architectural style had been abandoned for 50 years. 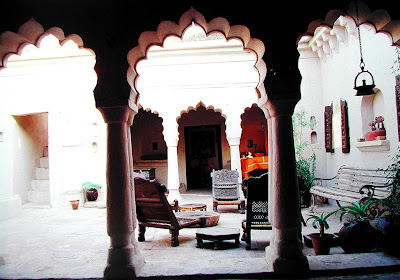 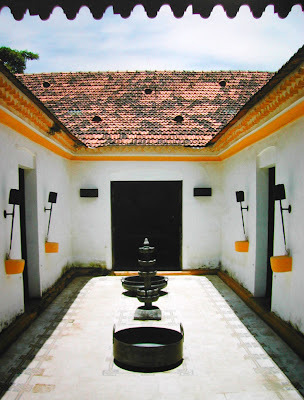 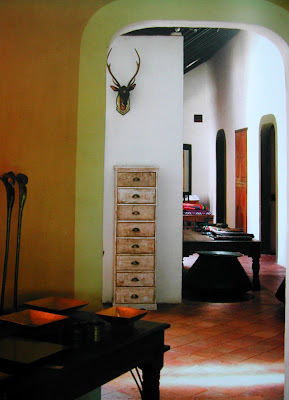 The exteriors were left untouched, all the 46 windows were opened to view the open landscape outside and only the courtyard & rooms were renovated & painted. 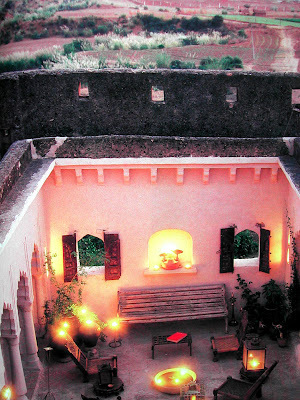 I just can't get over this spectacular space of the central courtyard. 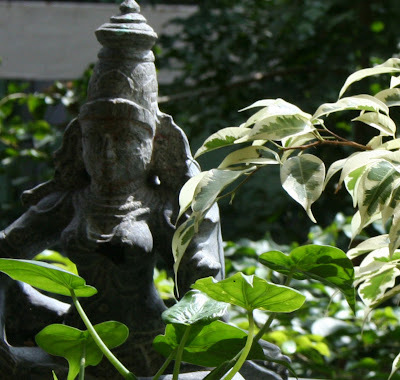 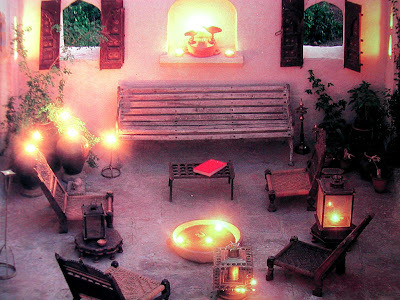 This courtyard comes alive with the warm glow of lamps in the evening during the celebration of festival of Lakshmi. 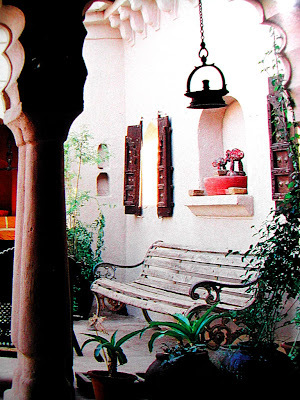 Close-up of one of the corners of the courtyard. 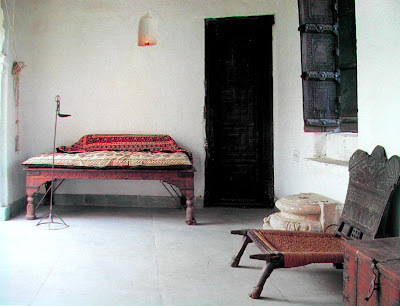 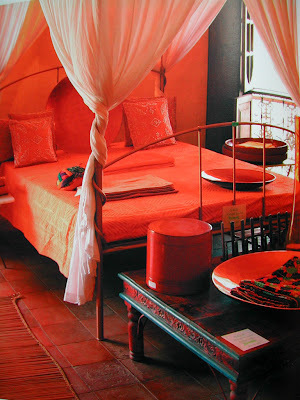 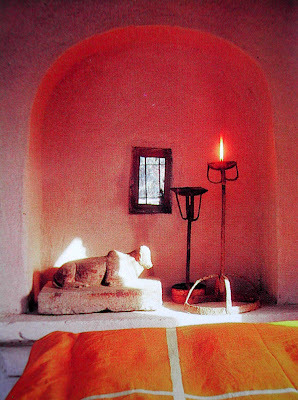 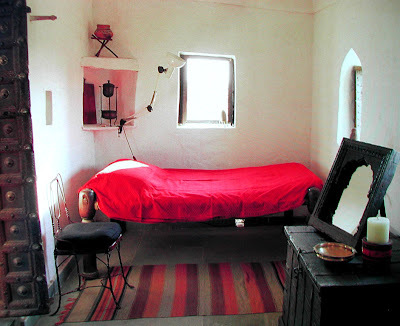 The table is a high bed (Takht) which has been raised on four stone drums. 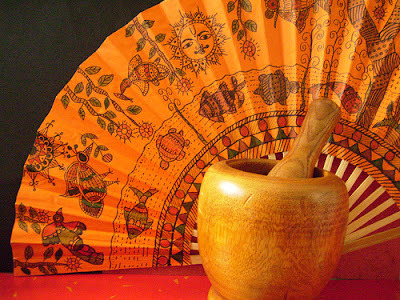 So innovative! 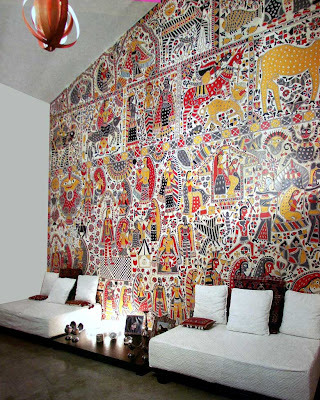 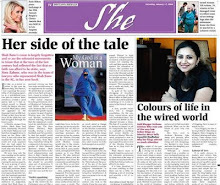 What a great job done by Francis Wacziarg and Aman Nath. 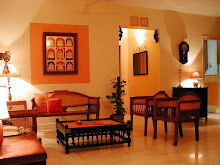 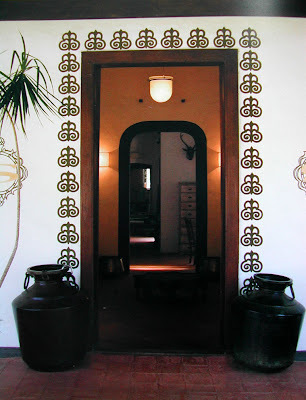 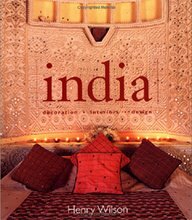 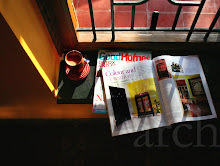 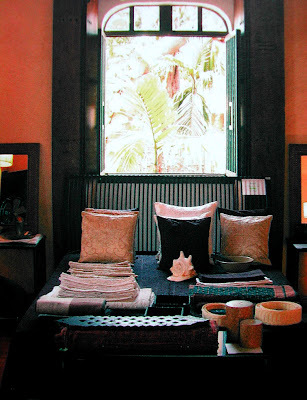 This fantastic 'Haveli' not only reflects the charm of the past but also accomodates the modern needs. 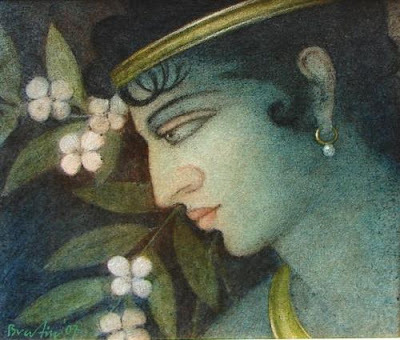 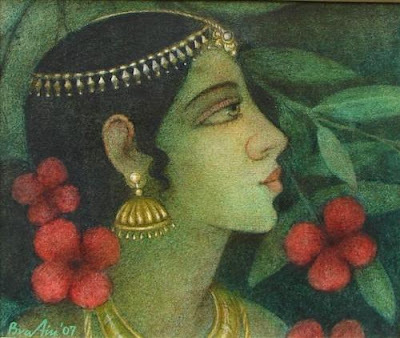 Radha These are tempera on canvas by Kolkata based artist Bratin Khan. 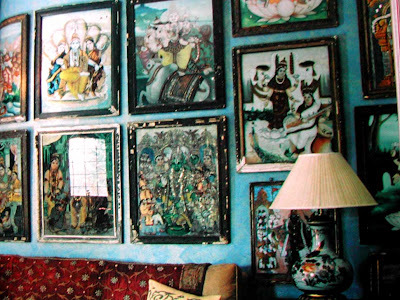 I can only imagine the beauty these paintings would bring to the space where they are placed. 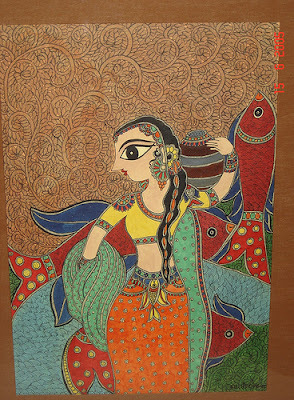 It is one of the ancient forms of painting from South India. 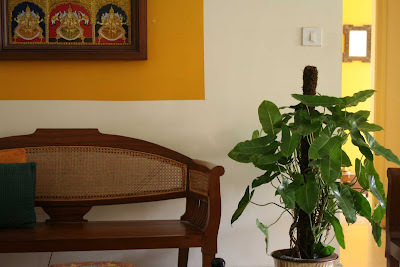 It is usually done on dark wooden planks. 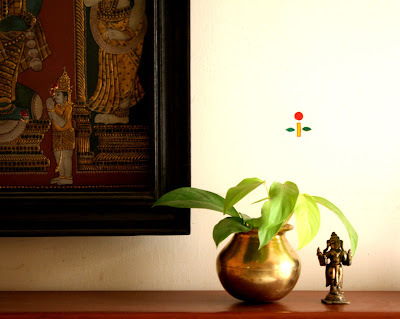 Tanjore Paintings have become very popular lately and are given as gifts & souvenirs. 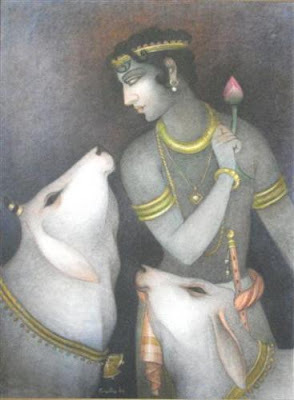 Interesting themes like 'Rhishaba Vahana'- Lord Shiva & Goddess Parvathi sitting on Nandi(The Bull), 'Gopi Krishna'- Lord Krishna with the Gopis' are some of my favourites. 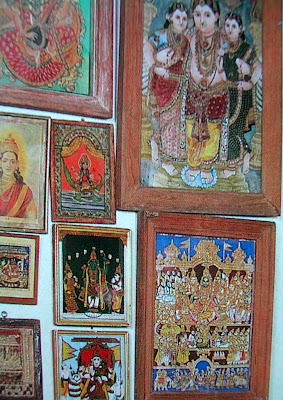 You could group Tanjore Paintings of similar colours together. 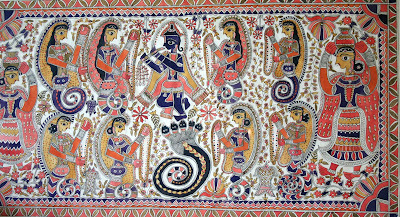 Group it together like an art gallery or ...focus on just one painting. 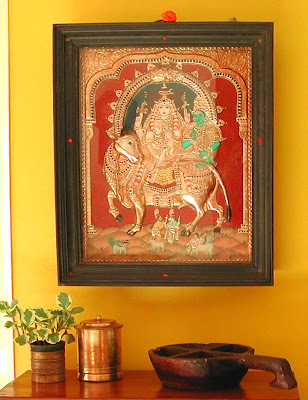 In our drawing room we've highlighted this 'Ashtalakshmi'- 8 Goddess Lakshmi painting by using bright orange colour on the wall.